Sometimes you hear a particular instrument and it strikes you as so odd and wonderful you wonder why you don't hear it more often. The banjo comes to mind, and, yes, the harp. I know what you're thinking. "Aren't harps played by fat people dressed as angels in cheese commercials?" Yes - also by that strange woman seen playing with classical quartets who knows too much about Wiccan Rice Krispie recipes. But they also create a window to some far off magical place. Be it in your mind, your heart, or as in the cheese commercials, your gut. All I'm saying is give the harp a chance. This explains a lot. Really. 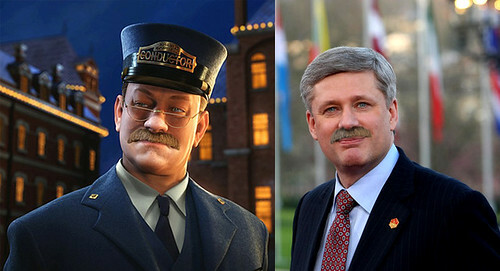 It explains why I didn't like The Polar Express and why I don't like Stephen Harper. The Uncanny Valley. People may be feeling more warm and fuzzy about our near (now nearer) human Prime Minister, but I just can't shake the feeling. For those of you, such as Robert Zemeckis, who are unfamiliar with the term, "uncanny valley" or "zombie valley" (which is apparently full of frothy mouthed Conservatives) I've provided this excellent and instructive quote for your benefit. A stretch of rainy weather and cloudy skies reminded me of Seattle, home to many pop/rock phenomenon, and the spiritual starting point for this mixtape. I came to know these three bands at around the same time thanks to sources like CBC Radio 3, NPR's All Songs Considered, KEXP from Seattle and surprisingly, Believer Magazine which publishes an annual collection of loosely curated musical selections. 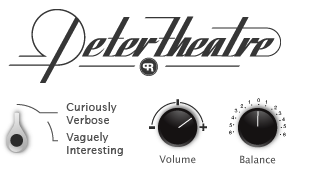 Intelligent lyrics (they use some big words), simple, personal stories performed to ruckus folk-rock melodies and a sort of anti-glamour touch of bittersweetness are hallmarks of Death Cab for Cutie, The Decemberists and The Shins. Is that what the kids-too-old-to-be-kids call "Emo" or are we in "Twee' territory here? Hmm, no, me thinks we'll preserve "Twee" for the Belle & Sebastian Mixtape. From that description, these guys are a set of bright t-shirts away from being the Wiggles. Yet there's a propensity for wearing geeky eyewear and getting the "indie" chick from the record store (or Zoe Deschanel in the case of Death Cab for Cutie's front man). Each of these bands have found a healthy audience while maintaining that unknowable metric known in this bureau as "indie cred". Enjoy and remember, grey skies are going to clear up. Eventually.